Contributed by "the Cooking Club"
excuse to ask for seconds to us. Yum! Can you taste "summer"? I mean, summer is a "season" not a "seasoning", right? Well, that may be true but there is nothing like fresh summer veggies to make for a great meal! So I guess I would have to be more "free-thinking" and say, "Yes! You CAN taste summer! We were fortunate enough to be able to harvest the first three zucchini from our Earthbox garden the other day. I gave two of them away and we used the third one to add to this great dish! Try it - you'll like it! Heat oven to 450° F. Toss eggplant, zucchini, tomatoes, oil, garlic, salt and pepper in large bowl to coat. 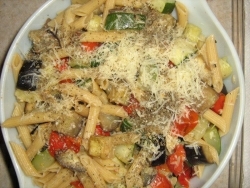 Toss pasta with veggies, any accumlated juices and parm in large bowl.